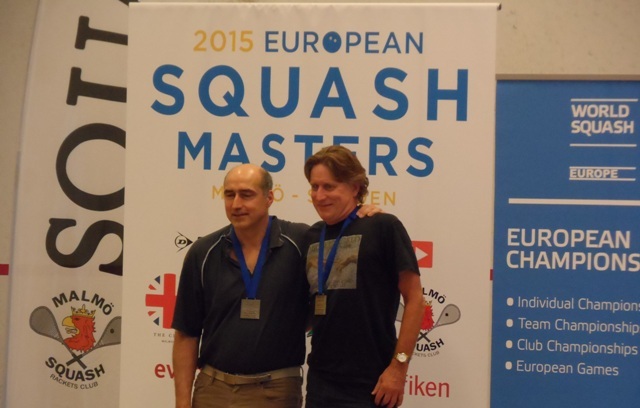 The European Masters Individual Squash Championships was held on 27 – 30 August 2015 at Malmo, Sweden. 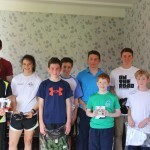 Ten Scottish players competed along with a total of 441 players in a Monrad format. 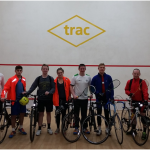 There were some outstanding Scottish performances: Alan Thomson won gold in the Over 55s (see photo); Paul Harris won silver in the Over 60s; and Jim Dougal won bronze in the Over 65s. Fourteen or fifteen courts were used between 2 clubs with players playing to final positions over the 4 days. The championships finished with an excellent reception and meal in the Malmo Town House.